Do the sales forecast for your small business provide an accurate picture of stark reality, but still encourage growth? With the possibility of higher profits on the table, no business owner should be content with a sales forecasting strategy that under-delivers. Salesfundaa CRM for can empower SME’s who may see a visible 15% reduction in inventory, and a 2% increase in revenue. A sales forecast ideally attempts to identify when, where, and how your customers buy your product. Smart sales leaders recognise that forecasting and strategy are related, yet independent of one another. An effective sales strategy can give you important insights into your forecasting efforts, and accurate forecasts can help you make wise decisions about improving your strategy. Still, a great forecast doesn’t automatically precipitate a sound sales strategy, and vice versa. As you refine your findings and take note of gaps, and successes, use these results to change specific parts of your sales strategy. But, always remember that a sales strategy exists to move customers through the pipeline, and deliver value. It is essential to consult all departments to make an effective forecast for future projections. Representatives of each department should be a part and contributor to this. This way different people who understand different sets of data can give important input that some one else might miss and may be a vital for analysis. This kind of teamwork encourages buy-in-essential and can have an immediate effect on company performance and strategy. Using past performance data to predict the present is the cornerstone of most sales forecast strategies. However, business realities, such as shifts in customer circumstances or industry developments, can change in an instant. So, you need to be ready to adapt at short notice if the environment is telling you to. Analysis and evaluation is an important process to achieve set goals. As change is inevitable. It’s best to allocate regular times for the forecasting process. It’s a good exercise to monitor change and allows you to prepare to deal with it. But care should be taken to strike the correct balance between what is humanly correct to deal with change. It’s possible to become too consumed with forecasting. This can turn useful points of data into a jumble of numbers with no clear through line. Look at the possibility of every sales projection to be opportunity. Don’t let speculation disrupt this process of forcasting. You are at the risk of handicapping your organisation by not considering these projections as valid opportunities. Also work out the possible next step. You need a clear and evolving view of trends impacting your organisation, and whether they’re expected to continue in the coming quarters and years. Observing high-level trends is difficult when sorting through data manually, as new data sets can push others out of mind and inhibit pattern recognition. 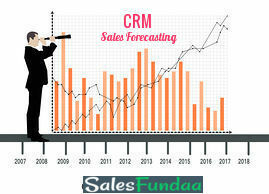 Thankfully, you can rely on Salesfundaa CRM for Sales forecasting- a technological break through that can take the manual labour out of this process. Learn from your incorrect projections , use them to constantly refine your methods and improve your accuracy in future. Understanding customer segments and buyer behaviour is an important part of forecasting accurately. You can manipulate your forecasts to say whatever you want, but your revenue numbers only move when your customers make very specific decisions, and take action. Learning what drives customers to act at various touch points in their purchasing journey, will assist in painting an accurate picture. This insight also helps mold the customer personas your sales and marketing teams rely on. Call SalesFundaa on 9235 35 35 35 for more solutions or you can leave your comments in the box below.